If the morning, as they say, shows the day, Nigerians should be worried by what the future of our democracy portends. Although the electioneering campaigns for the February 2019 election begins officially just today,politicians across board have already given indications of what to expect with their actions and utterances in recent weeks. Far from being a contest of ideas and issues, what the managers of the campaigns seem prepared for is how to throw muds at one another. It may therefore be important for the Independent National Electoral Commission (INEC) to remind the candidates and their parties of their obligation to run decent campaigns as stipulated in the code of conduct for the elections. 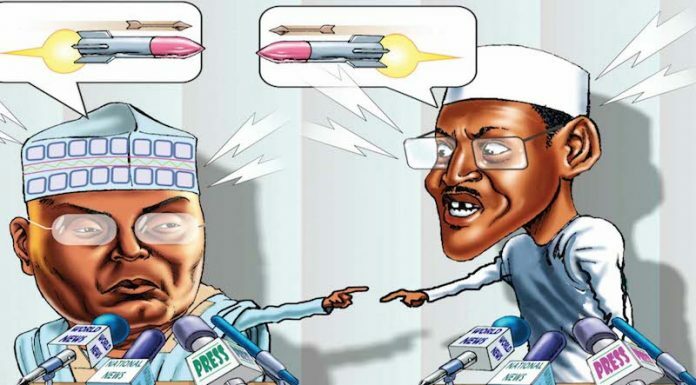 Although there are dozens of candidates and political parties in the contest for practically all the offices, including the presidency, the protagonists of these negative campaigns can be located mostly within the ruling All Progressives Congress (APC) and the main opposition Peoples Democratic Party (PDP). For instance, officials and operatives of both parties have only been trading accusations and counter-accusations of corruption without telling the people how to address the multifarious challenges crying for attention. Abuses, name-calling, damaging allegations and releasing video and audio messages in the social media are the new campaign weapons. Meanwhile, in recent weeks, Nigerians have been treated to a gale of defections by politicians at virtually all levels as they seek tickets to contest elections. While we concede that these politicians have the right to defect to any party of their choice, especially in seeking platforms to realise their ambitions, a situation where those who aspire to lead the people change parties like articles of clothing raises questions about the content and character of our democracy. Interestingly, many of them only see the bad side of their parties whenever they stop benefiting from tickets, positions and appointments. More disturbing, however, is that less than three months to the presidential election, the amount of abusive and inciting messages making rounds in both traditional and social media is sickening. Yet as we have stated in a recent editorial, more than at any period in our history, Nigeria needs a clear direction on the way forward, especially in three critical areas that have proved difficult for succeeding administrations: restoration of security, prudent management of the economy and tackling of corruption. Who will handle these issues better is a question the electorate should be able to answer before exercising their franchise in February next year. For sure, the coming presidential election has thrown up some respected candidates who ordinarily come with brilliant ideas. But majority of them are disadvantaged by lack of resources and weak political structures. Some of them are also inexperienced and command no name recognition. Therefore, it is safe to conclude that the choice before the electorate is basicallybetween incumbent President Muhammadu Buhari of the APC who is campaigning on a platform of sustaining his legacy and the PDP candidate, Atiku Abubakar, a former vice-president who is campaigning to â€˜make Nigeria to work againâ€™. The 2019 general election is very crucial for our country. Nigeria is today confronted by a myriad of problems: our country is regarded as the poverty capital of the world; there is a serious crisis in social sector like education and health. Despite repeated promises by succeeding governments, corruption is still pervasive. Majority of our young people are jobless and losing hope and the security challenge is monumental. How will the candidates deal with these challenges? How will they get the country out of the woods? These are the issues of the day that must be addressed. The essence of political campaigns is to help the electorate in making the right choice. That can only happen if there is a contestation of ideas on critical issues (not on religion, ethnicity, certificates or who is more corrupt than the other). Besides, this time around, Nigerians deserve more than the usual distribution of consumables and the procurement of musicians, comedians and dancers to entertain crowds in the name of political rallies. Beginning from today, the candidates should speak to the issues that affect the ordinary Nigerians. And they should tell us how they will address those challenges. We have had enough of sabre rattling.